The Jerusalem Chamber, (c) Westminster Abbey. I’m writing this from Borough High St. in Southwark (London), a few blocks from Southwark Cathedral, and in the vicinity of what used to be Winchester Palace, the London residence of the Bishop of Winchester. Lancelot Andrewes, translator of the King James Bible and perhaps supervisor of the First Westminster Company, was granted the bishopric in 1618. 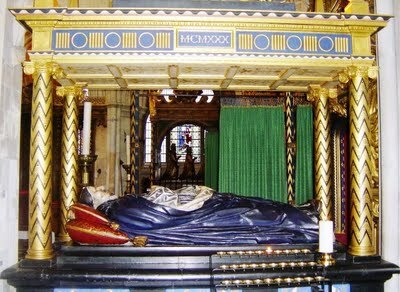 He is buried in Southwark Cathedral and is represented in effigy lying on top of his tomb. London is full of reminders of the translation of the English Bible. Across London Bridge, which is just up the road and on the right, is the church of St. Magnus Martyr. Miles Coverdale, who translated the first complete English Bible (apart from the Wycliffites), is buried there, since he served for a time as rector. William Tyndale. English translation, Pentateuch. 1530. Ohio State University. William Tyndale, translator of translators, is buried in Vilvoorde in the Netherlands, where he was strangled and burned, but his sculpted head is included as a decorative architectural feature at St. Dunstan-in-the-West, where he lectured. John Donne later preached at St. Dunstan’s. 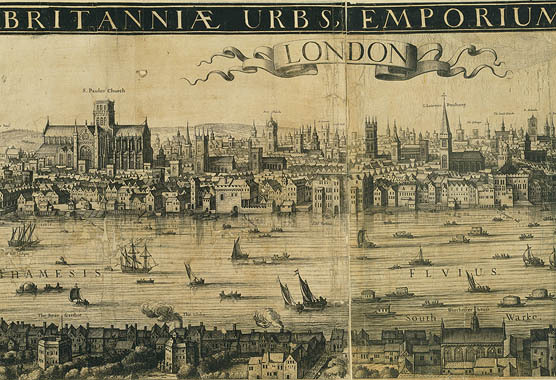 A little south of St. Paul’s, where Donne was dean, stood the church of Holy Trinity the Less, destroyed in the Great Fire. 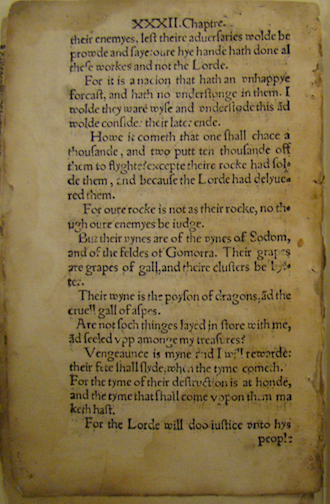 John Rogers, the man responsible for Matthew’s Bible (1537), was rector there a few years earlier. He was later burned alive as a heretic at Smithfield, a 10 minute walk north, near the church of St. Bartholomew the Great. Benjamin Franklin worked briefly for a printer in the Lady Chapel of St. Bart’s. Of course, Westminster itself, the location of two companies of the King James Bible translators, is down the Thames to the west. Thomas Bilson, Bishop of Winchester (before Andrewes), member of the Second Cambridge Company, and one of the revisers of the final King James Bible text, is buried in Westminster Abbey, as is, of course, King James I. Archbishop Matthew Parker, who supervised the translation of the Bishops’ Bible (1568), is buried at Lambeth just across the Thames. Erasmus. Novum Testamentum. 1519. Corpus Christi College, Oxford. The celebrations of the King James Bible anniversary have died down here. There are no upcoming events listed on the website of the King James Bible Trust. And in the United States, the tour of Manifold Greatness comes to end on July 12—oddly enough, my birthday. 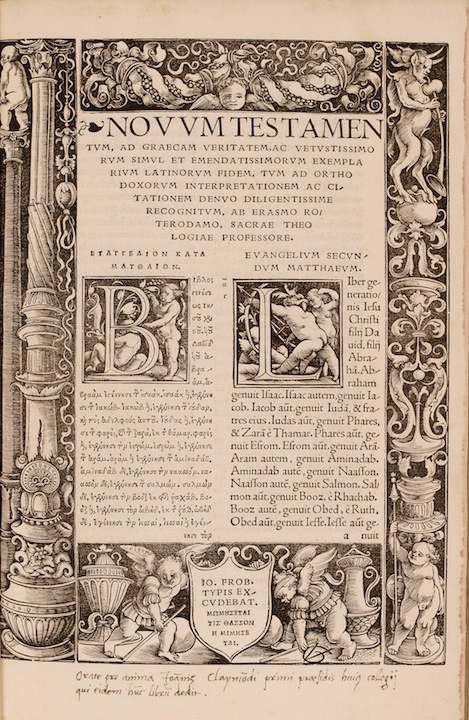 Perhaps more appropriately, it is the date of the death of Erasmus (1536), who produced the Greek text of the New Testament that became known as the Textus Receptus, an essential resource for translators from William Tyndale to the King James Bible companies. 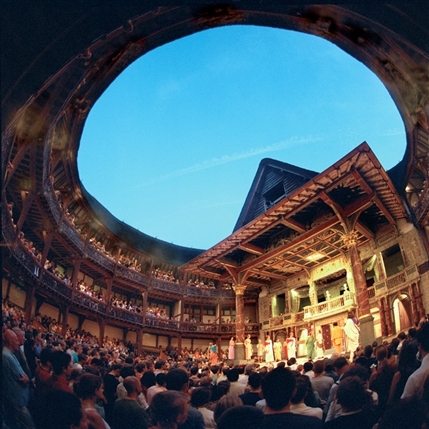 The Bible at the Globe. Courtesy Carol Kelly. 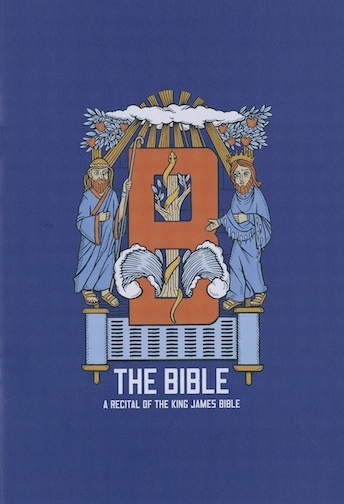 “The King James Bible was written to be read aloud. 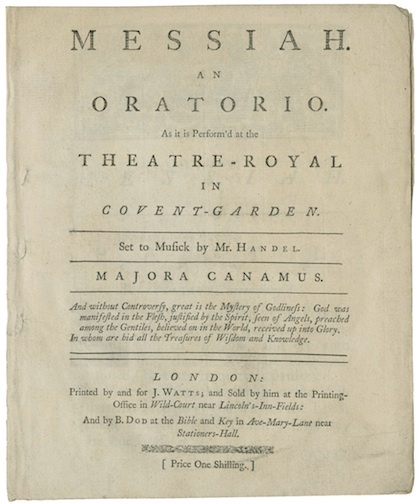 It was a performance text or it was nothing.” This stirring declaration by David Hall, head of classics at Dollar Academy, in his essay in the theater program shown here, suggests one reason behind the plethora of nationwide and worldwide recitals of the KJB in the last few months, including this one at the Globe in London that covered the entire text. The setting provided the perfect link with Shakespeare, whose plays, too, were written to be performed, not read. I attended the Easter Sunday afternoon recitals of the Gospels according to St. Luke and St. John at the Globe. Four actors, two male, two female, took it in turns to recite the entire texts, in sections of about ten to fifteen minutes each. I wasn’t sure what to expect in terms of visuals—I was hoping they wouldn’t have someone reciting from a pulpit dressed in Jacobean clothes! In fact, the four young actors were casually dressed, which added not only a comfortable informality to the proceedings but also seemed a good way to reinforce the notion that this Bible still speaks to us today, just as it did four hundred years ago. The text was piped discreetly into their ears with the help of i-players but this did not detract at all from their delivery, which was engaging and fluent. The actors moved around the empty stage, at times addressing the audience, at times delivering their lines to the whole cosmic world with clarity and thought-provoking intensity. They brought out the wonder of the words but also the humor and humanity behind the familiar stories. 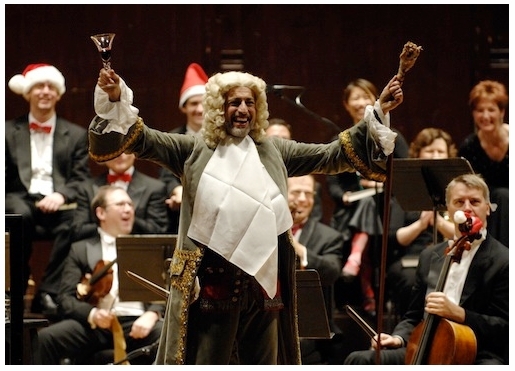 The recital was designed so that people could come and go freely, and folks taking the tour of the Globe that day were ushered in and out to sample a short section of the recital. I was apprehensive about being able to sit for four hours on a seat with no back, listening to a recital with minimal visuals, but it was far from being a challenge. The experience made me appreciate not only the power of those words, but also the human voice as an instrument of communication. I thought of seventeenth-century churchgoers hearing the King James Bible for the first time. This recital brought the words to life, where they belong. Carol Kelly is the Festivals Project Coordinator for the Education Department of the Folger Shakespeare Library, Washington, DC. 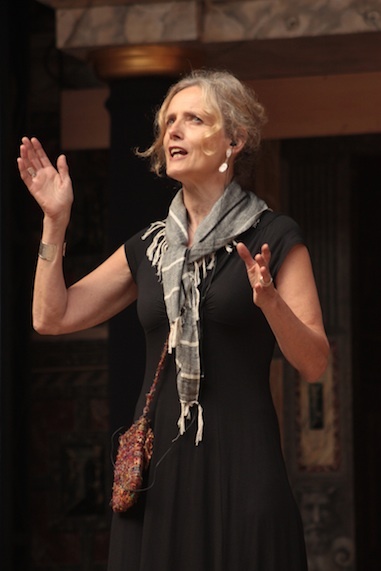 As she notes here, she attended the April 24, 2011, afternoon performance of the Shakespeare’s Globe read-through of the entire King James Bible, which we previewed in this earlier post. Well, I’m back from London. As per my previous post, I was there for a week (and two days in Stratford) with a class on “Literary London.” Fabulous as always, though I hadn’t expected a solid week of sunshine. Lots going on over there for the KJB anniversary. We toured the New Globe Theater on the Southbank and saw posters for their onstage cover-to-cover KJB reading. The Globe is also staging some Bible-related plays in their upcoming season: Marlowe’s Doctor Faustus (nothing to do with KJB but certainly wrapped up in religious issues), and Howard Brenton’s Anne Boleyn, which features James I, William Tyndale, and John Reynolds, as well as the title character. The Royal Shakespeare Company is getting in on the act too. I had dinner with Michael Boyd, the RSC artistic director, and Jacqui O’Hanlon, the director of education, and they talked up a new play about the translation of the KJB, Written on the Heart, by David Edgar, that they’ve commissioned for their next season. There are more KJB books out now too that I hadn’t seen yet, Derek Wilson’s The People’s Bible, for instance, and one soon to be released by Melvyn Bragg, The Book of Books. My own The King James Bible after 400 Years, co-edited with Norman Jones, sold out its first print run in a couple of months. Cambridge is scrambling to get another printing out soon. What an appetite there seems to be for KJB books, play, readings, and shows! And wait til Manifold Greatness is launched on the world — website, book, panel show, the mother exhibition in DC!! Steve Galbraith and I have already had several queries about visiting lectures from libraries hoping to host the panels. All very exciting. At various points on our London tour, guides and docents would ask if we knew about the KJB anniversary. I felt rather proud to be able to say I was at the epicenter of KJB activities on the other side of the ocean. Visscher. View of London. ca. 1625. Folger. We’ll be standing on ground of huge importance to the making of the King James Bible and its subsequent history. 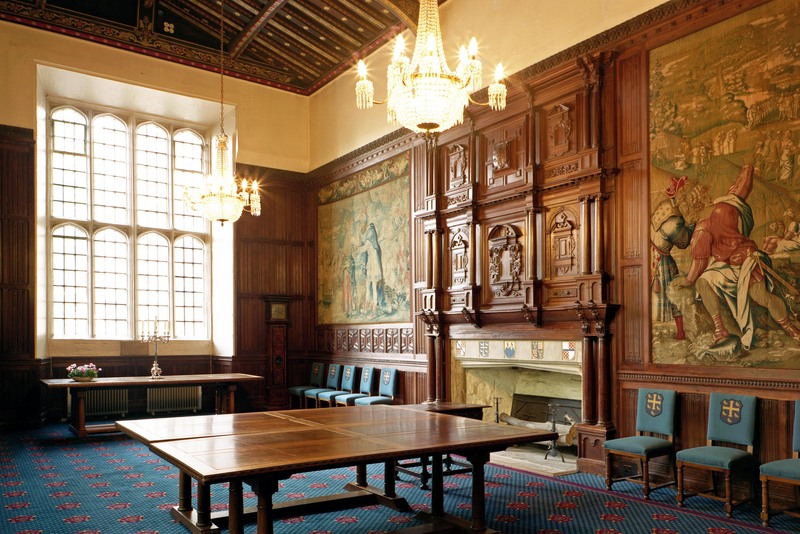 We’ll tour Westminster Abbey, for instance, where two of the six teams of translators were ensconced; they worked in the Jerusalem Chamber, a location Shakespeare also mentions in Henry IV, Part 2. We’ll also visit St. Paul’s and Southwark Cathedral, where English Christians have heard the KJB read and sung for 400 years. Some of Shakespeare’s theater colleagues worshipped at Southwark (then St. Saviour), since it was near the Globe; his brother Edmund was buried there. The playwrights John Fletcher and Philip Massinger are also buried at Southwark, as is the great preacher Lancelot Andrewes, one of the KJB translators. Our last two days are in Stratford, and we’ll visit Holy Trinity Church, where it’s possible Shakespeare himself heard readings from the then-new King James Bible. He retired to Stratford about the time the King James Bible was published, and this was supposed to be the Bible translation used in English Churches from then on. Whether Holy Trinity actually purchased and put to use copies of the KJB before Shakespeare’s death in 1616, I don’t know.